This is my third menu item dessert. On our summer menu we had a rhubarb cobbler dessert which sold well and was easy to plate. As fig season was coming to a close necessitating the removal of my last dessert, the pastry chef asked me to start working on an apple cobbler dish to replace it. Simple but delicious desserts are very important during this season because the high volume and large quantity of parties require us to plate much more quickly to keep tables from waiting on dessert. Unfortunately, I’m not that good at simplicity. I tried, really I did. My first attempt (the picture above) was actually quite easy to plate but as it got adjusted for the menu, it became more complicated (the picture below). What is a cobbler? What makes a dessert a cobbler and not a crumble or a crisp? Which one did I want to make? First, let’s break it down: it all comes down to the toppings. A cobbler has a cookie like topping. It usually has lots of flour, butter, cream and a leavener to make it puffy. It can be rolled out and placed on top or tossed in clumps. A crumble doesn’t have a leavener and frequently has oatmeal, brown sugar and sometimes nuts. Therefore, it makes a crunchier and nuttier topping. A crisp is very similar to a crumble except that it usually has the addition of spices such as cinnamon, nutmeg, or ginger depending on what will enhance the fruit that it is going with. So, which one did I pick? Pick? Simplicity? Why have one when you can have all three? The flavors in this dish did not change between the Sunday supper version and the menu version. The apples are heavily spiced and steamed briefly to make them slightly tender but still toothsome. In the original version the apples were cubed but it was determined that the texture was a little strange, and cubing the apples is very time intensive. Underneath the apples is a crumb topping made up of toasted oatmeal, graham cracker crumbs, panko, and polenta. This is mixed with brown sugar and browned butter. This isn’t a true crumb because without the addition of flour and more butter it doesn’t actually hold together in clumps, but it is still very textural and nutty in flavor. 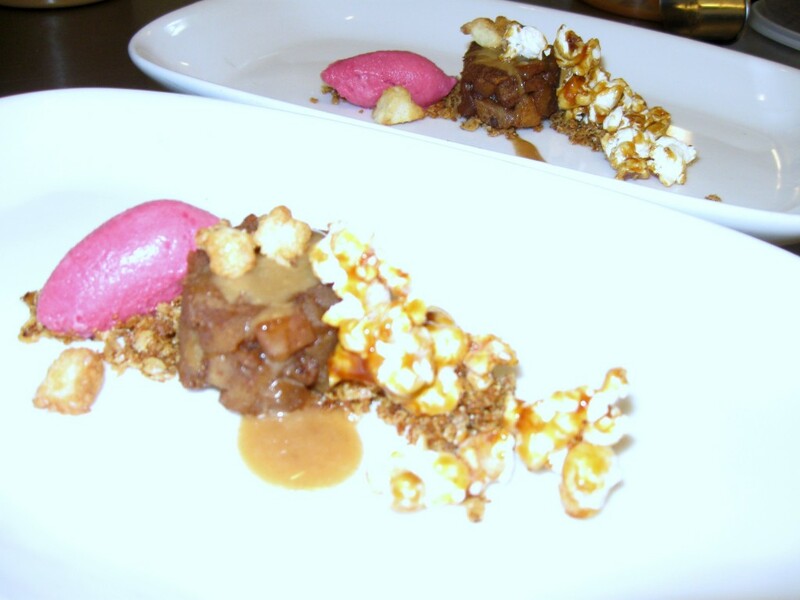 On both versions there is also puffy, cobbler topping, carmelized popcorn and a reduced apple cider sauce. The sorbet is made from fresh cranberries roasted with rosemary and then pureed, with enough liquid and sugar added to make a smooth sorbet but not so much that it loses the tart, tanginess of the cranberries. On the menu version there is also the addition of dehydrated apple chips which add a lovely height and a little more apple flavor. This dish is on the menu as an apple cobbler though it could have just as easily been called a crumble or a crisp because it also has aspects of those desserts in the crumble on the bottom and the heavy spicing of the apples. I also think the caramel corn can be considered an additional topping but it doesn’t fit into any of the categories. However, I choose cobbler because I felt it best encapsulated what I wanted the feel of the dish to be but occasionally, I will hear from a server that the diner was expecting a classic apple cobbler in a ramekin with more cobbler topping. 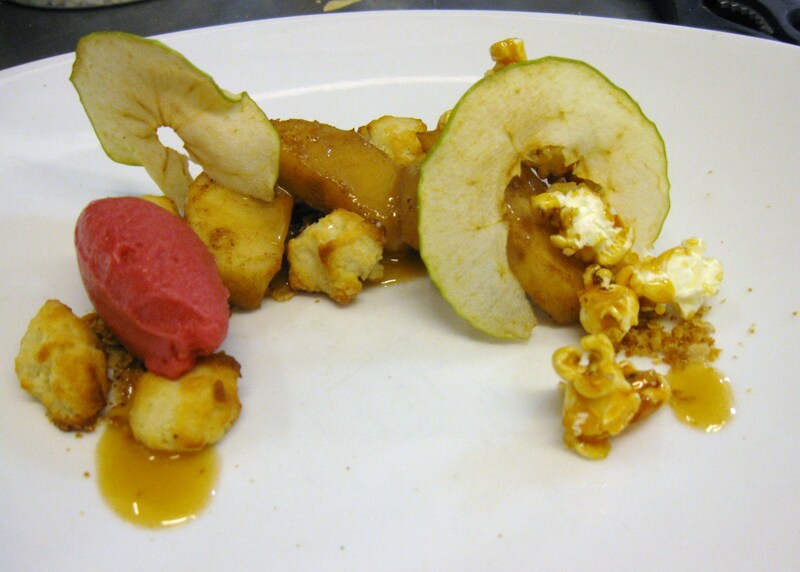 I agree, my version is very deconstructed especially because of the size of the apples and the variety of topping like components, however, I am also not sure why a diner would expect a generic dessert when the rest of the menu is far from standard. I would actually think that this dish would please those who like a classic cobbler because I didn’t mess with the flavor, just the presentation and some additional fun flourishes. So, instead of being hung up on the occational critique, I think I will instead find pleasure in the fact that the plates frequently appear licked clean.